Sift flour and baking powder on the table. Take butter out of the fridge, cut it in small pieces and rub it with the flour using your fingers, until you get a crumbly dough. Make a dwell in the middle and put sugar, egg, vanilla extract and salt. Lightly beat these ingredients with a fork, then start mixing them with the flour using a spatula. Work the dough until it gets smooth, trying to be as quick as possible so that it won't get warm. Wrap in plastic and let it rest in the fridge for at least two hours before using it. You can also prepare the tart dough one or two days in advance and keep it in the fridge until ready to use it. For the cream: toast blanched almonds in the oven for few minutes, making sure they don't get too dark. Grind them finely in a food processor until they turn into flour. Beat eggs with sugar until they are fluffy, add butter cut in small pieces and keep mixing at high speed. Add flour, almond flour and almond extract and mix until you get a smooth cream. Refrigerate until ready to bake. To bake the tart: roll out the dough and place it in the baking pan (I used a rectangular pan, approximately 14x4"), cover with parchment paper and put ceramic weights on top (you can also use some dried beans instead), so that the crust won't rise too much. Bake for 15 minutes at 350, take out the weights and parchment paper and cover with a thick layer of frangipane cream. Wash grapes and dry them thoroughly. Cut them in half and place them on top of the cream with cut side down, pressing them slightly. Cover with slivered almonds. Put the tart back in the oven and bake for about 30 minutes more, until crust and cream turn a nice golden color. Let it cool completely, then dust the surface with confectioners' sugar. I WAS good, so good that I was tempted to smell it and nibbled at a small piece that fell off before it was even served. Listen, when are we starting our saturday routine again? Sounds perfect for the upcoming Valentine's Day. I take it that it can be catered to any proportion just in making sure that the ingredients are also adjusted for the fix. I am quite thrilled to try this for the weekends. Allow me to compliment you first with your blog, this is so pretty! I love it. 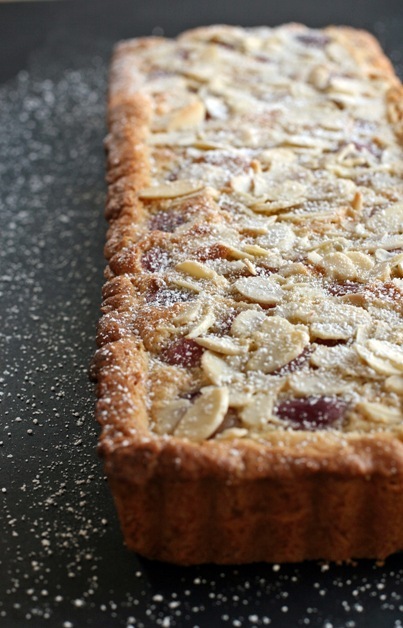 And your tart is amazing, the kicking soft side of the grapes and the rough side from the almonds make it more enjoyable for kids. I would make plenty of this! Thank you! This makes me want to keep up with the English translation, I haven't been doing it much lately, but I'll try. As for the tart, I am so glad you liked it. I haven't made it in a while but I remember it being really good and other friends who tried it really enjoyed it. Thanks again.